We recently added a new service called Hoopla! It is a website/app that patrons can use to check out ebooks, audiobooks, TV shows, movies and music on their devices. Each patron is allowed eight items a month. The items range from new and popular to the classics. I have started to play around with it a little bit. I like that there are a wide variety of books, old Disney movies, British TV shows and soundtracks available. I recently realized that I can even add the app to my Fire Stick and stream the movies on my TV! How cool is that?! One of the features I found most intriguing even though I do not read a lot in the genre is graphic novels. The site has a very good selection. While enjoying the story the reader can hover their mouse over the images to enlarge them (because sometimes that print is very small). This also helps when looking at the artwork and seeing more of the details. Summary: Sabrina Spellman, a teenage witch is the daughter of a mortal and a warlock. On the eve of her sixteenth birthday she has to make the decision to join the Church of Night. She is currently living with her two maiden aunties in a funeral home. Highlights: I picked this as one of my first items to check out from Hoopla. I had recently watched the new Netflix series based on the graphic novel and I watched the original TV show as a teenager. I enjoyed the stories in the first volume. They are very dark! The art work is very interesting. 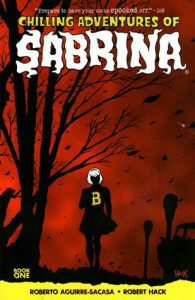 I never read the Archie comics (which these are a spinoff of) but several characters from their universe appear in the Sabrina stories. So if you are expecting the nice and bright Melissa Joan Hart version this is not it. Salem, the cat, is still here as well as her aunts, Hilda and Zelda, but after that everything is different. Lowlights: Since graphic novels are more centered around the art work the stories are much shorter. I wanted a little more story but I guess I will just have to check out volume 2 for that. FYI: There is very dark themes and imagery.